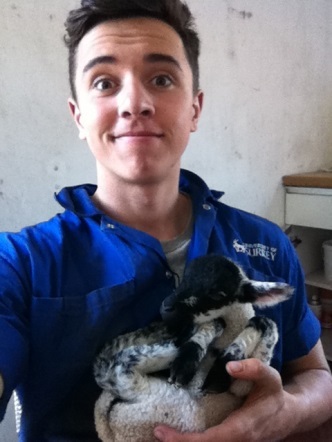 I’ve done a lot of work with farm animals in the past, but never lambing. After phoning around a list of contacts, I finally secured a placement near Brighton. I was expecting to be put up in a barn but my accommodation was a pleasant surprise and my hosts incredibly welcoming. After a long first day of learning the basics, such as stomach tubing, how the farm operates and the technique for ringing lambs, I went home, only to be woken in the middle of the night and called out to a heifer which was having trouble calving (the farm has cattle too). After trying to assist it, we called the vet. The end result was that I got to scrub in on a caesarean, at midnight, using the headlights of a jeep for light. Three weeks raced by. My top tip for placements is to ask stupid questions, because usually, they aren’t stupid. I had a brilliant time and have been invited to go back. Although it’s tiring, it’s really rewarding.